Pressure is mounting on the Obama Administration to respond more decisively to the situation in Syria after the White House conceded that it believes the Syrian regime has used chemical weapons against its people. After all, on Aug. 20, 2012, the president said, "a red line for us is we start seeing a whole bunch of chemical weapons moving around or being utilized. That would change my calculus." He reiterated his warning on March 21, 2013: "I've made it clear to Bashar al-Assad and all who follow his orders: We will not tolerate the use of chemical weapons against the Syrian people, or the transfer of those weapons to terrorists. The world is watching; we will hold you accountable." The result of Washington spending more than two years on the sideline, watching as the death toll tops 80,000, is that the most effective options for dealing with the crisis have evaporated, leaving few good choices on the table. At the start of the uprising in March 2011, U.S. intelligence agencies could have been vetting potential partners in the Syrian opposition and providing them with lethal assistance. When in August 2011, President Obama called on Syrian President Bashar al-Assad to "step aside," he could have worked with NATO to create a "no-fly zone" or establish a safe zone for those fleeing Assad's forces. But the president decided against offering assistance to the non-Islamist opposition -- whose protests provided the spark that ignited the Syrian conflict. Without providing arms and supporting vetted groups from the Free Syrian Army, the U.S. will have no proverbial dog in the fight to help shape Syria's future in the aftermath at best, or prevent even bloodier sectarian massacres at worst. Today, well-funded jihadist and Islamist forces have hijacked the revolution and taken the lead on the battlefield, supported by wealthy donors from Saudi Arabia and Qatar and beyond. That is to say that by sitting on the sidelines, Washington has contributed to an outcome that guarantees continued ethnic cleansing. At this point, if Assad goes, either Salafi terrorist organizations aligned with al-Qaeda such as Jabhat al-Nusra will take over, or the newly reconstituted Syrian Muslim Brotherhood will rule and a settling of scores will continue. If Assad remains in power then Syria will remain an Iranian and Russian puppet with rivers of blood flowing through its hands. This represents a difficult challenge to American values and interests. A menu of bad choices remain that nevertheless necessitates that Washington act. It should do so focusing on two primary concerns. The first is seeing that there are dire consequences -- punishment -- for crossing a self-proclaimed red line. The second is securing, removing, and dismantling Syria's chemical and biological weapons. Without a stern response it becomes more likely that the Syrian regime will use chemical weapons again on a wider scale. This sets a dangerous precedent for what the U.S. is willing to endure from violent and despotic regimes. Iran will have no reason to believe there will be consequences for continuing to enrich uranium and Israel will have no reason to believe the U.S. will act to prevent Iran from acquiring a nuclear weapon. Islamist adventurism and acts of terrorism against Western targets will likely spike as America will be perceived as a "paper tiger," as Osama bin Laden once put it in a 1998 interview. To prevent this, the Assad regime should be punished in the form of a U.S. military strike against key regime installations and government buildings. This is not to suggest that the U.S. should fight a war on behalf of the Syrian opposition or that it should be a sustained campaign. But enemies and allies alike should understand that the military option remains a viable course of action and that U.S. red lines are not pink. 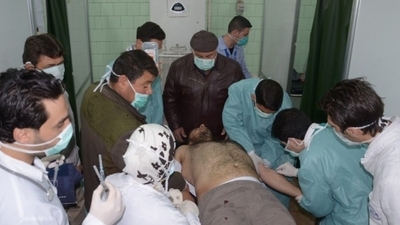 Regardless of Western intelligence assessments, the Syrian regime freely admitted to possessing chemical and biological weapons on July 22, 2012. It is a vital American interest to secure these weapons. It would be catastrophic if Syria's chemical weapon were transferred to Hezbollah or if the Salafi terror group, Jabhat al-Nusra, were to acquire them given their links to al-Qaeda. In order to secure those stockpiles some combination of forces and intelligence sharing between the United States, Israel, Jordan, Turkey, and European states is required. If the White House cynically chooses to remain on the sideline and watch the death toll grow, it should at least remove the most dangerous weapons from the equation. Sometimes the U.S. cannot choose the conflicts it enters; sometimes conflicts choose the U.S. and require American leadership to solve. The reality of what is happening in Syria requires more than passive support of a non-lethal nature. Despite Barack Obama's aversion to becoming involved in Syria, he will likely have no choice as the massacres continue. He set his own red line and as he said, "the world is watching." And so America's credibility is at stake in a region that continues to value the strong horse.